The CTD 400 series Cut Off Saws are designed for heavy duty production cutting of aluminum, wood, plastics and steel. These rugged, heavy duty machines offer years of precision cutting. 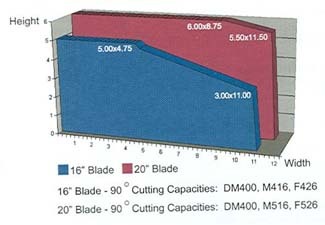 Blade Capacity: Models M416 and F426, 16'' OD; Models M516 and F526, 20'' OD; saw blades not included. Arbor: 1'' with 5'' collars. Spindle and Pivot: Spindle mounted on preloaded and sealed bearings; with V-belt drive completely enclosed; pivot uses Timken bearings lubricated for life. Motors and Starters: 7-1/2 HP 3 phase 230/460V totally enclosed fan cooled motor with magnetic starter standard; 10 HP and 15 HP motors available as optional extra. Floor Stand: Heavy gage steel sheet and angle. Table Base: Precision machined cast iron base with milled keyways to guide fences; disc set flush with base. 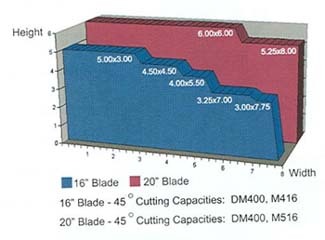 Production Rate: Up to 10 strokes per minute; actual production rates will vary with the type and width of the material to be cut. Actuation: Hand operated standard; optional power downfeed of sawhead actuated by Two-Hand, Anti-Tie Down Maintained Contact Safety Control. Air Pressure and Consumption: 3 CFM at 80 PSI based on 10 strokes per minute; air filter/regulator/lubricator with auto drain included. Size and Weight: 48'' wide x 40'' front to back x 70'' high; weight is 850 lbs.